The winner of this race has not been in doubt since FP1. Marc Márquez had half a second on the rest of the field in practice, and that translated almost directly to the race. He built a lead of 6 seconds in 8 laps. Nobody was going to catch him here. Márquez takes over the lead of the championship, and we're heading to Austin. Márquez has never been beaten in a MotoGP race on US soil. History says he will return to Europe with a bigger lead than he has now. That puts him in good shape to kick off the championship. If the victor was a foregone conclusion, the battle behind him was superb. For most of the race, there were between five and eight riders in contention for the podium. There are lots of ways to go fast around the Termas De Rio Hondo circuit, and the battle for second epitomized that. At places like Turn 7, Turn 13, you could see the variety of lines, all of which worked. It's a great track, which doesn't get used enough. How close was the field? All six manufactures finished in the top ten, though there was an element of luck involved. If Franco Morbidelli doesn't take out Maverick Viñales – a race incident, as Viñales characterized it, no malice intended – then it would be six manufacturers in the top twelve. And from Valentino Rossi in second to Pol Espargaro in tenth, there were less than 16 seconds. That is a tight field. Valentino Rossi demonstrated the value of a solid qualifying position. After an outstanding race at Qatar, ruined by the fact he had to start from fourteenth, starting from the second row put him in a much better position to get back on the podium for the first time the Sachsenring last year. "It was crucial," Rossi said in the press conference. "The qualifying is always very difficult because really everybody are able to squeeze the tire and the bike 120% for one lap. If you do 110%, you are in the third row. So starting from the second row is a lot better, but also because I arrive ready. I arrive ready to the qualifying because I have already good pace." Spies said it... "on that one day at Assen, I was the best in the world"
I was very pleased to see Baldassarri pick up the double. I enjoy the style he rides with and it looks like this season, he’s figuring out the race craft behind it all. A very similar strategy to his boss, in the premiere class. And same goes for Morbidelli, prior to the bash up. Strong, firm but clean passes. Hats off the the VR46 Academy. It wasn’t so long ago that operation was a start up. Valentino is breeding serious talent. I love the new format. I’m usually dying to read the in depth report, but this definitely will satisfy till then. Thank you!! With apologies to Eddie Izzard, MotoGP needs to have a wider range of penalties available. A ride through for Cal was in no way representative of the incident's potential impact on the race results. 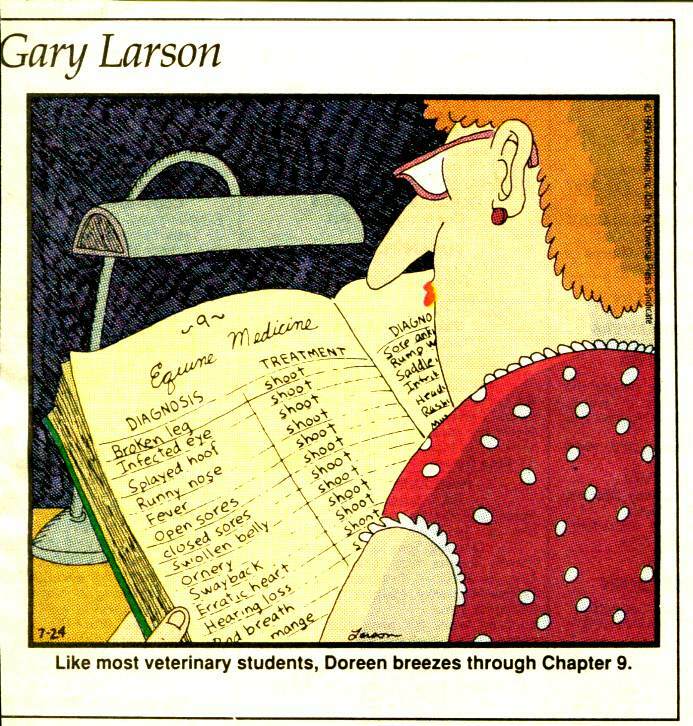 Yes, rules are rules, but perhaps something a little more plausible than Gary Larson's take on Equine Medicine is needed. To me there is a simple solution: For a minor infraction, the most that could be gained by the rider (deliberately or by mis-adventure) is to get to the first turn ahead of the other two riders on the same row of the starting grid, so the penalty would be a message saying "DROP P2" in the first few laps. A real shame for Cal who is looking brilliant and heroic this year. Cheers. PS - David, your latest innovation in reporting is great! Agree about the penalty. My tuppence worth, open to suggestions, of course, is that the call needs to be based on something objective so as not to be open to accusations of bias. Maybe a 'long lap' if the front rim is not forward of the rider's starting box line; and a ride through for anything greater. Having a fixed measure would enable it to be confirmed on slo-mo/freeze frame quickly and the appropriate penalty applied. This is perfect David. Perfect format to give us first feed back before the big report. Marquez: shoud we create a side championship just for him? On another planet. I cannot help but agree that Cal's penalty was harsh. The rules are clear (in this case at least!) and harsh. I agree that they should be reviewed, but until they are race direction has no option. Far harsher was Cal's intensly personal comments about Freddie Spenser. I read his comments (moved less than a centimetre, was stationary when the lights went out) before seeing this video and thought that right, Freddie was a bit harsh. After seeing this video I think that Cal has clearly embraced our new, post-truth era. He embassases himself. As a supporter of the Brit riders, this weekend left me feeling a bit deflated after so much promise in free practice and qualifying. John McPhee had the speed to win, but fluffed qualifying and although getting to the front early on seemed to struggle getting mired in the pack , until the incident on the back straight that led to the fall a couple of corners later. Nice to see Tom Booth Amos on the first page of the rider positions on screen at the end though. Similarly Jake Dixon's name made it to the first page. I hope both riders make the breakthrough as the season progresses. Sadly Sam Lowes binned it again. I thought we were seeing a new, more mature approach from Sam this year, but at the weekend a rushed first corner put him in a difficult position and there appeared to be not a lot he could do to reach the first 4 for the duration of his race, maybe he was biding his time and saving the tyre, but it all came to nought, when he exited stage left again. Finally Cal... What can you say? His race pace looked second only to Marc and he would surely have made the podium, but hey! That’s racing and one year you win the next you fight for a few points. Finishing only 3 seconds behind Jorge surely brought a wry smile, but its scant reward for a fighting, competitive rider who is at his best this season, despite the injuries and melancholy pre season. Marc Marquez? on another level!, surely the same situation next time in COTA.. See ya! I want to like Rossi, I really do, I respect his multiple championships and competitive longevity, but its amazing how a podium makes him smile instead of the glowering contempt that he displays when other riders have the temerity to beat him. But his ability to come out fighting on a Sunday and turn around any practice or qualifying difficulties must leave Maverick wondering what he has to do, especially when Franco gets in the mix with his mentor. My final thought is for Alex Rins. I was in full agreement with the BT sport crew that the Suzukis would be up the front all weekend. It didn’t happen prior to the race and they seemed to struggle, but to come from 16th to be pushing for the podium showed that there is a lot more to come from that bike rider combination this year. As 2019 unfolds the story lines that keep us enthralled continue to build and the entertainment value gets better year on year... Freddie Spencer just needs to remember push starts and the way it used to be. Maybe the he and the race control guys can bring a little bit of sense to their rule interpretation. Always ask for room for discretion and proportionality. Seems like they went overboard with both on the Aero rules but completely forgot these principles when they framed the jump start rules. You can explain the former problem by the political dog's breakfast that are the manufacturer rules, but the latter does rather have the odour of nobody quite thinking the possibilities through enough. Still I have to agree that attacking the rule keepers for applying the rule, as written, is not a great idea. While we are talking about rules though: MM seems to have his own physics system at this point. I just don't understand how he can prove so much quicker than the field. He can be difficult to like but it is impossible not to admire his ability and his effort. His career is starting to look like the '...greatest rider in the greatest era...'. I appreciate that VR46 fans will disagree but even they might admit that the argument in relation to MM's career achievement is starting to add up. Thanks David for great early coverage and other commenters for incisive remarks. Quoting Gary Larson was hilarious and perfectly illustrated your point Jinx! Marc: was he ridding a 1200? COTA will be the same....who's gonna be fighting for the podium. Gotta appreciate his unearthly ability. A simple mistake made without malicious intent, giving him no measurable advantage, cost Crutchlow somewhere around 25 seconds (he was 4.659 sec. behind Marquez on lap 4; 30.886 sec. behind on lap 6). COTA - Marquez riding irresponsibly during qualifying, blocking Vinales on the racing line - penalty is dropping 3 grid spots*. What’s that actually, a one-second penalty? Malyasia - Marquez riding irresponsibly during qualifying, blocking Iannone on the racing line - penalty is dropping 6 grid spots*. What’s that actually, a two second penalty? * In both cases, Marquez retained the listing of pole position in the official record books. Crutchlow’s penalty just doesn’t seem to fit the crime, no matter the “rulebook.” Some race series won't call a jump start unless the front axle has passed the end of the box before lights-out. I'd like to see the stewards award him the standing he would have had, minus the actual time spent in the ride-through. Marquez is a genius, but he is coddled and has long gotten away with some unbelievable stunts on the track. I suspect that this is Dorna working the show - they probably think that it's bad for ratings if your "best" rider / factory is constantly black flagged for ramming other riders, or otherwise engaging in unsporting behavior. The Argentina thing last year was insane (he should have been DQ'd, 100%, as soon as his bike was pointed the wrong way). Crutchlow always comes off as aggrieved so when he has case, as he does here because the penalty was patently ridiculous, it's harder to listen to him. He probably should have restricted his comments to Marquez (rather than Spenser and Rossi, who doesn't to me seem to get the benefit of the doubt very often - recall that bizarre Malaysia a few years ago, and that was championship affecting) and it would have come off better. But that's Cal - he's authentic, to a fault. I like Marquez's riding style for the most part (and I'd like to see him try the same on a 500) and he's a worthy champion. I do not like his attitude, which, while partially understandable, is built on a false premise. Marquez is superb, but in his early MotoGP period he had a definitive mechanical advantage which flattered his results immensely and probably didn't help his ego problem and I doubt he's really any better than say Lorenzo, Stoner, Rossi, Doohan etc. (among those recent five it'd be bike / tire dependent I think: Rossi has the most style, Stoner was pure class on a bike, Lorenzo on his day is "perfect" and Marquez is constantly over the edge and they all are dangerous sharks - the only issue with that grouping is that I could see Marquez causing an accident among all of them). I think you are onto something here David. Good work. Love the new format, more please! Cal.... can I stir the pot as a neutral. Cal has been racing bikes for more than 20 years. He must have done hundreds if not thousands of race starts and know the (simple) rules inside out. In my book he has no cause to complain about the incident, only about the rule. Yes, the punishment was wholly disproportionate but that’s also the rule. It’s still pretty disproportionate when the rider gains a mere one or two metres, isn’t it. In fact the only time I’ve seen it being remotely close to fair was when Jorge was halfway round turn one before the lights changed (wasn’t that in Argentina too?). Blaming Freddie Spencer is plain silly - if he let that go, what about the next time when the rider rolls 10 cm... or 20, or 30? You have to draw a line somewhere and right now it’s that the bike mustn’t be moving at all. Better and fairer to lobby for better rules and allow the stewards some discretion? Maybe. But that too is a Pandora’s box and someone always gets a raw deal sooner or later. Me, I’d keep it simple, and if there’s an ‘absolute’ solution available, I’d go for that. Which is what we’ve got. I doubt Cal will ever rock like that again. ... he needs to drop his 'Honey Badger' attitude that he's so proud off and learn that you don't make statements, phonecalls, or write letters when you are angry.... you wait until the next day. He has ended up looking foolish because the video released (the next day) showed that he was rolling at the start, however little. That's against the rules and, as a professional racer, he knows that. The bigger issue is the extent of the punishment. I think his ride-through was excessive and that the new extended lap punishment would have been fair and would still have allowed him to probably come second. I don't dislike Cal... he is a great racer but he just needs to calm down before looking at a camera because his temper isn't doing him favours off-track. Not sure it’s a "temper" - more a burning desire to succeed that any sportsman needs light the fire in their belly. Cal tends to wear his heart on his sleeve and as such can leave himself open to criticism, but in "quiet" interviews you can see he is sometimes very guarded in his replies. Pre season he downplayed his situation, so I think he understands the gamesmanship that most riders play. I see him as not being a robotic sponsors plaything, who gives corporate answers.. He says what he thinks at the time and when the adrenaline is running hot, he says what he thinks. More power to him for being that way in the environment he works in. I doubt it's temper or burning desire, he says what he thinks even without the addrenaline. It's either the image he want's to project or his personality. Either way I'm not a fan, for the same reason that I'm not a fan of Oasis. So the Michelin tires and Dovi have been really slowing things down whenever he is at the front. Wasn't Argentina supposed to be a high deg circuit on those tires? yet Marc took off like a scalded cat and I was worried at his pace he would have burned through his tires but he did what 1.39 the whoel race pretty much? I have a feeling even Michelin engineers are scratching their heads as to how Marc pulled that off? Anyone remember what compound tires he was on? Mediums? If he was on Mediums that must be ominous for the rest of the field because Honda had a propensity to only work real well with Hard tires no? Honestly I am very surprised since the processional races begain the Michelin era that Marc was able to pull that off! Well done! He pulled a Lorenzo on the field! I'm sure may readers recall the tyre smoking Gary McCoy who, at the turn of the millenuim was spinning up the rear tyre of his WCM Yam through the corners to steer the bike (there were riders doing something similar but to a lesser extent before and after). Contrary to accepted wisdom at the time, this didn't drastically increase tyre wear but instead (supposedly) prolonged it - I seem to remember the "explanation" was that heat was confined to a more superficial layer of rubber when lots of slip was present. I wonder whether Michelin could engineer a tyre now that rewarded a high degree of slip. It would surely make for more dramatic racing if riders needed to maintain a smokey cornering style for the majority of a race before pulling the pin in the closing laps! I am sure I'm not the only reader hitting ReFresh awaiting it. Thanks in Advance & Cheers! It's getting on for lunchtime Friday here and no report as yet, I'm climbing the walls for my fix! :D I've no doubt it's going to be a cracker but my thought is that they need to land by Wednesday night Euro time to remain relevant as an actual race roundup. Even on a non-race-weekend I'm sort of 'past' the last race and thinking of the next one, and if it's a non-race weekend then I've likely got lots to do and MotoGP starts to take a backseat until the next Thursday rolls around and it heats up for the next race. So I think it might be better to cover what is possible in order to have a roundup out by around mid-week, and perhaps seperate out any deep analysis issues (such as jump-start-gate from this race) into a later article that helps us span the time till the next race weekend. On the other hand I suppose is that David's articles are achive quality reference material of a type rarely found in journalism these days. Quality writing takes time, to collect facts, speak to different people, and even to just "let it sink in" so that the case can be presented in a way that gets to the heart of the matter as he usually does. No doubt the article will land as soon as I post this, and it will be well and truly worth the wait, but that's my two cents on the general format and frequency. I love the 'Fast Notes' idea, but actual Race Roundup should hopefully be out while the race is reasonably fresh in our minds. The full report is up now, later than intended (my apologies for that) but various bits of life intervened, including the Assen WorldSBK press conference, at which Ten Kate announced their return to the series. That meant it was an event I couldn't miss. Traveling there and back cost me half a day, the whole event cost me a day. Argentina race round up is here. In the future, the aim is to get the race report up on Tuesday night / Wednesday at the latest. But sometimes that won't be possible, due to time / travel constraints. The problem is that the race reports seem to get longer - now clocking in at 7,000 words, and it takes time to assemble those words and sort them out. The subscriber quick Sunday notes gives Subscribers something to tide them over. I do enjoy your writing David and always look forward to the race reports. I was thinking about subscribing awhile ago to be able to read all the other content since now it is all subscriber only, but the fact that the race report are getting later and later is what has stopped me. This is the reason why I can't be.a site supporter. It's Thursday and there is no race report yet. It's fine when it is free but it isn't when you pay money .